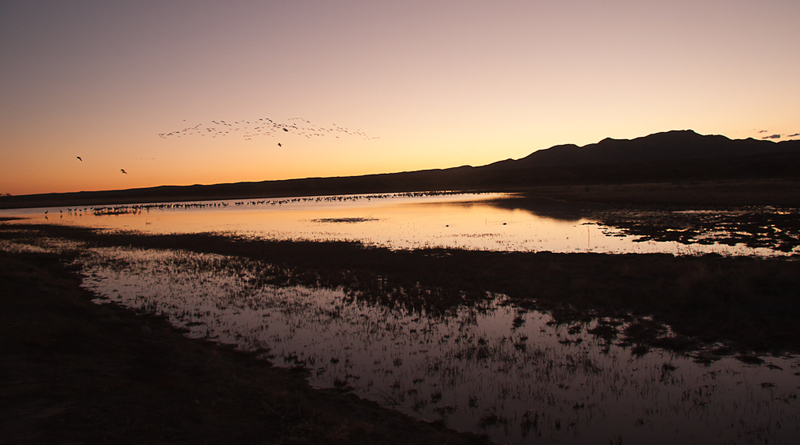 Bosque del Apache sits nearly in the center of New Mexico and it is one of our favorite places to visit, especially this time of year. 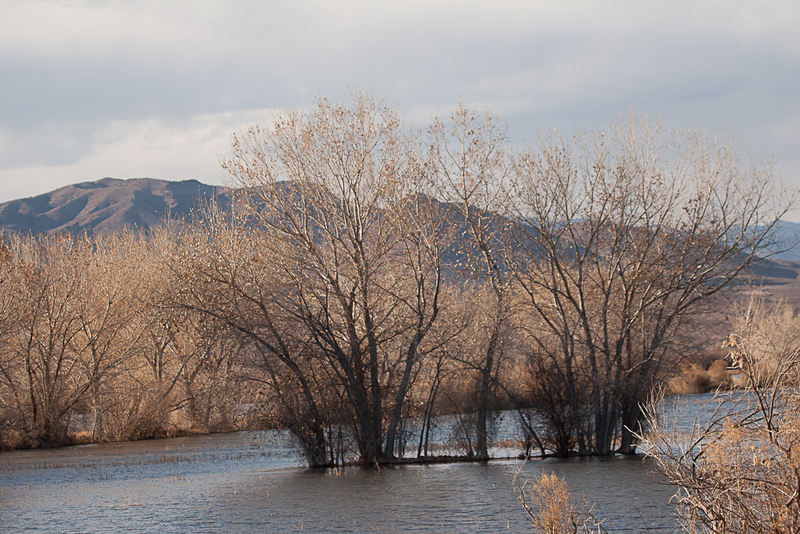 It is a major bird refuge for winter water fowl. Even if you are not a birder, it is worth a three-hour drive from just about any place in the state. For that matter, serious bird watchers come from all over the United States. Snow geese and Sand Hill cranes number in the thousands, and there are many Canada geese, ducks, grebes, coots, golden eagles, and bald eagles as well. If you plan a visit, you should do it soon, as the birds will be leaving in the next few weeks to start their northern migration to the plains and tundra of Canada. You should also plan your visit so that you arrive just before sunset or before sunrise. 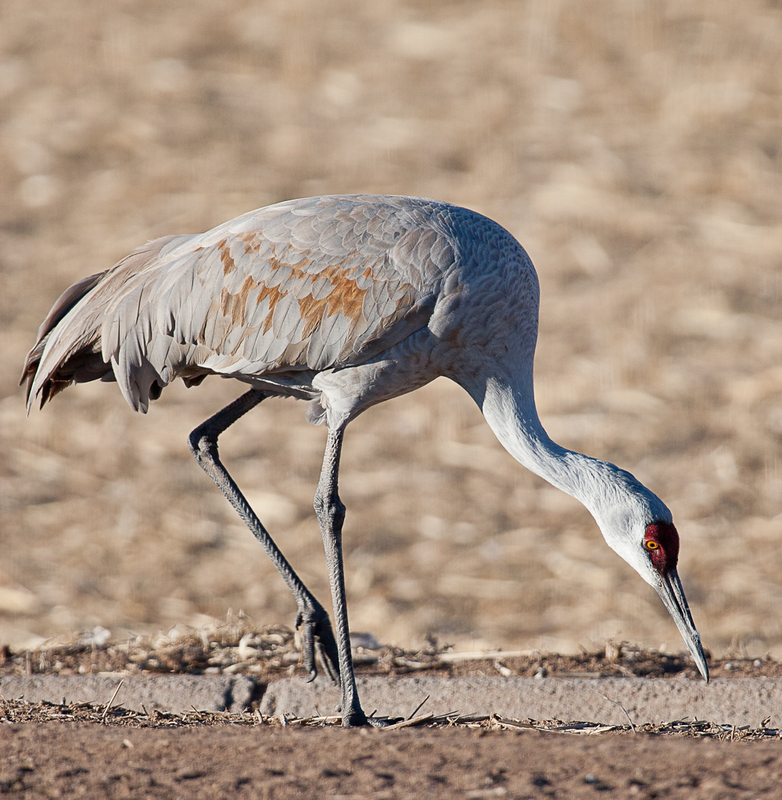 During the day, the cranes and geese have been feeding in nearby grain fields. 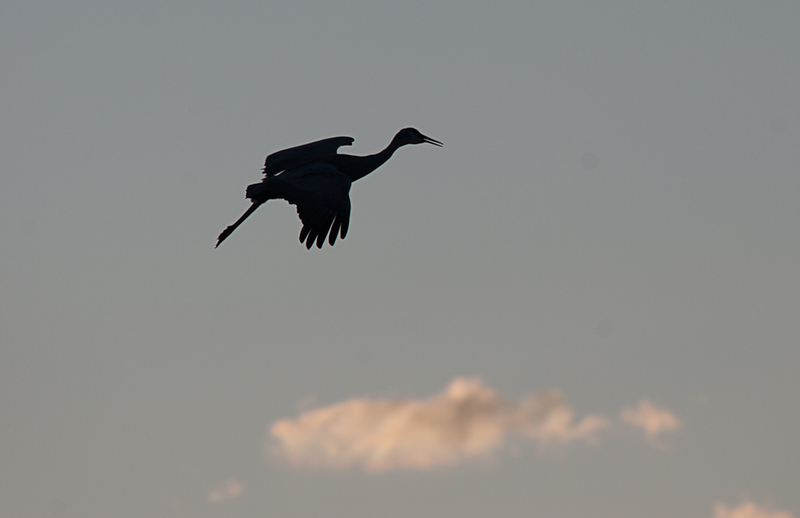 When evening comes, the birds fly into the many lakes and ponds to spend a cold night safe from predators. 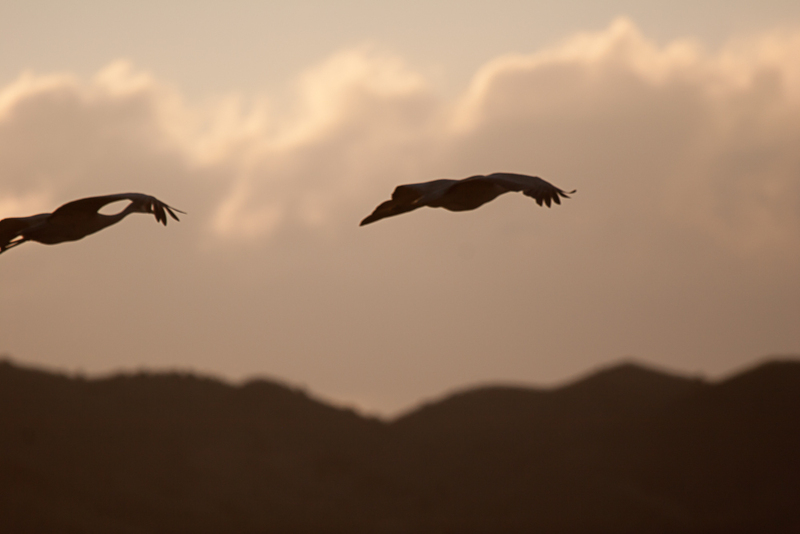 The evening arrivals are spectacular, as large flocks fly in, making loud noises and silhouetting themselves against the mountains and the sunset. The morning flights are also beautiful, but you need to be in place well before dawn to catch the show. To get there, travel on I-25 to the little town of San Antonio. Directions from there will be clear. When you arrive, your first stop should be at the visitors’ center where friendly volunteers will tell you the current viewing sites – they tend to change over time. Then plan a leisurely drive around the loop to see raptors, smaller birds, dabbling ducks, geese, and cranes feeding in the fields. There is a small fee for the trip because even though this is a federal reserve, it is not well-funded. The fee is worth it. Time your tour so that before the sun has begun to set you are in place for the main event. 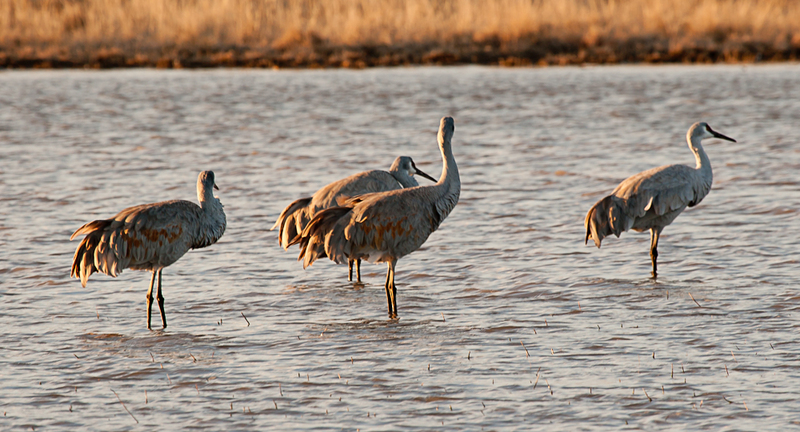 Have your camera and binoculars at the ready because gradually the cranes will begin to come in, first by ones and twos, and eventually in great noisy flocks that continue to land in the shallow lakes even as the light fades into night. In the morning, the flights may be even more amazing. Usually, as if by some signal, the birds will depart in one great cloud and with noisy chatter. But they are early risers, so you will miss the even if you are not in place well before dawn. If you want to catch both the evening and morning performances, there is a small RV park nearby. Otherwise you will need to plan on staying in Socorro, a half hour or so toward the north. San Antonio has another claim to fame: it is home to two of the great stops on the Quest for the Best Green Chile Cheeseburger. The Owl Café is an institution, and for many years we stopped there on our trips between Santa Fé and El Paso. We always drove by a little bar on the other side of the road. It looked like a honky-tonk, and its glowing beer signs and its name, “Manny’s Buckhorn Tavern”, seemed only to confirm that. One night, though, we ventured in. It was not very crowded, and the crowd was clearly made up of locals. Bob Olguin, the owner and son of the founder, was behind the grill, cooking and chatting with everyone – us included. 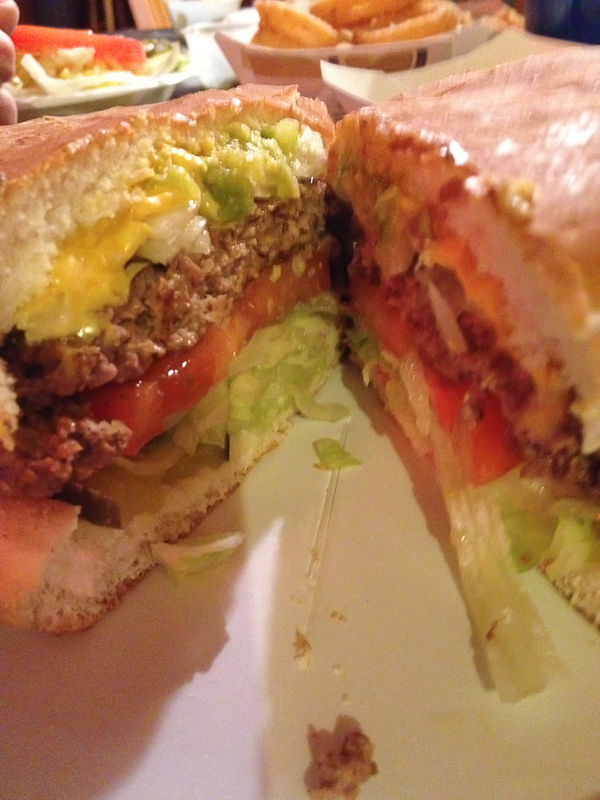 We ordered the Buckhorn burger – green chile cheeseburger – and thought we had finished the Quest. 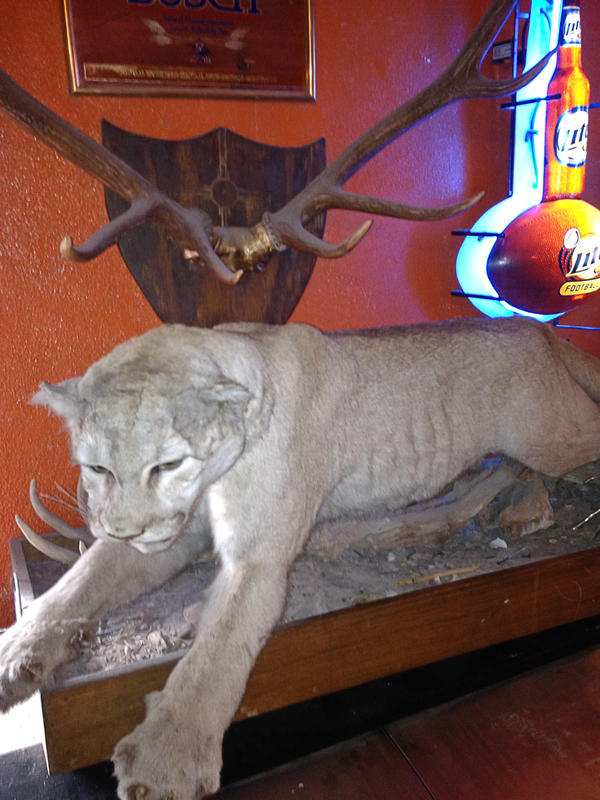 For years, we stopped at the Buckhorn; the crowds got bigger; but Bob kept his place at the grill. Then he wound up on national TV in a throw down with Bobby Flay. Since then, the crowds have become huge, especially during tourist season, and now there is a sign directing you to wait until seated. Bob no longer works the grill, but he visits each table as customers wait for their burgers. 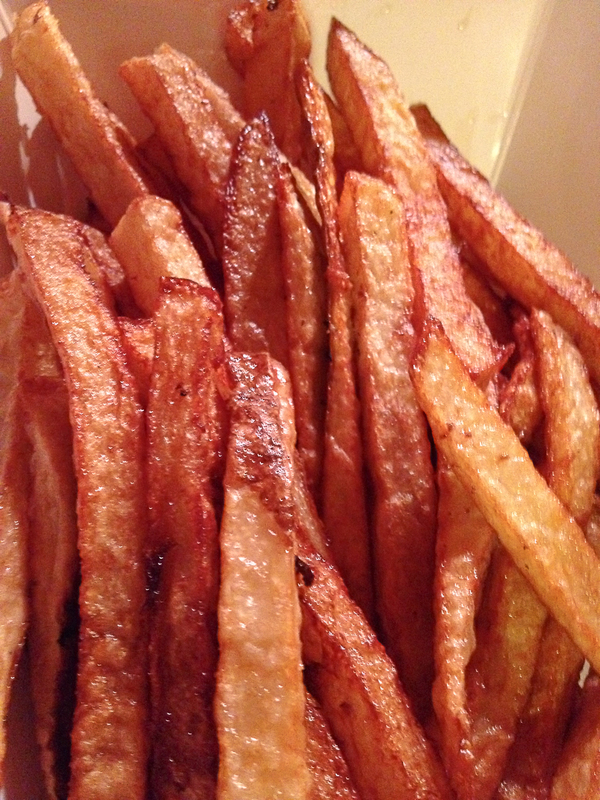 Still, the atmosphere has not changed, and the Buckhorn burgers are as good as ever. The experience is one you shouldn’t miss. 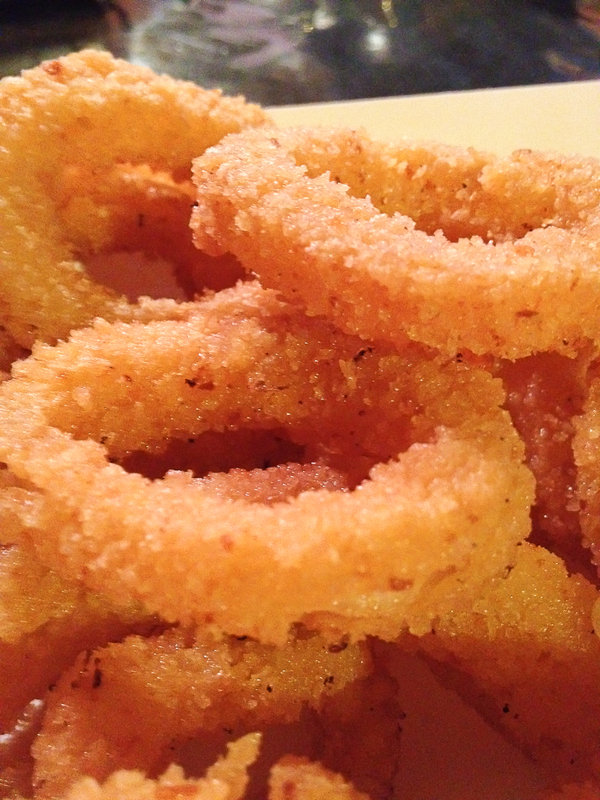 Just be sure to get fries or onion rings with your order.